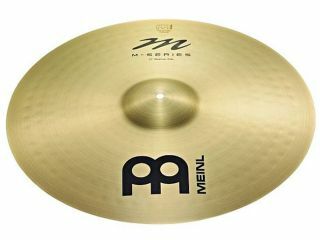 PRESS RELEASE: Made in Germany from B20 bronze alloy featuring high-tech computerized manufacturing standards, the new M-Series cymbals have warm musical tones with plenty of volume. Traditional look and feel combined with a modern sound and distinct clarity. They have been developed for the needs of literally all styles of music and are therefore the perfect all round professional cymbal series. Available now are a 14" hi-hat, 16" and 18" crashes, and 20" and 22" rides. All medium weight. M-Series hi-hats have an outstanding clear and bright stick sound with a fat chick, due to the heavy weight bottom. Strong and powerful response with a controlled feeling. M-Series Crashes have rich sounds which intensify the characteristic of the B20 bronze alloy. They speak very quickly with beautiful warm undertones, and shimmer with brilliance and musicality. M-Series Rides have a clear, crisp stick definition with a shimmering spread. Rich sounds with a good degree of color and plenty of warmer undertones. Nice shaped bell that projects loud and clear.